Hello! Spring is officially here and as I am working to get back in to a more regular posting schedule. I thought I would share some of my favorite work outfits for the month of April. First up, is a polka dot dress that I think will be a centerpiece of my spring and summer work wardrobe. I was torn between the dress and the skirt but I have a fair amount of pencil skirts and I liked the layering options for the dress, whether it be with a blazer or button down underneath the dress. I could keep it more toned down with neutral shoes, but…why would I do that? My first thought was to give the dress a kick of color with a pair of hot pink pumps and a coordinating J.Crew inspired fan necklace from a few summers ago. For the office, I added a navy blazer with gold buttons. 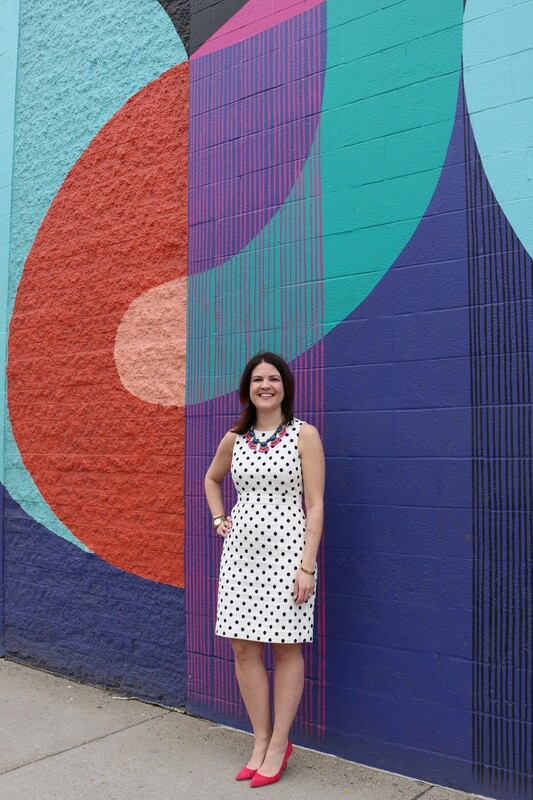 And, how perfect is this mural as a backdrop for the outfit? I (finally) recruited a few friends to help me take some photos around our beautiful city over the weekend and plan on making it a more regular thing. I have gotten so used to doing my photos “on the go” in the morning and sticking to Instagram which subsequently means that the blog gets somewhat neglected if I’m not re-posting my Instagram mirror shots or doing J.Crew try-ons. I’ve been wanting to incorporate other photos in to my posting schedule and give the blog more love so this was a good way to help set that up. I think I’ll still re-post prior Instagram content for these monthly posts but I’ll be trying some new things over the next few weeks and trying to get more “on the spot” outfit photos on the weekends when I tend to slack! So…bear with me and I welcome your feedback. Here’s another look at the outfit from my outfit of the day post on Instagram. Next up, another one of my favorites from the month of April. I know. Florals, for spring? Groundbreaking. (I couldn’t resist). The print on this skirt wasn’t an immediate love for me. But I went back and tried it a few times and I think once the skirt finally fit me the way it should have, it added to the appeal. I love the retro vibe it has going on and I wanted to toss a denim jacket on over my sweater but I settled for a chambray blazer since it was a work day. This is probably not a floral I would attempt to pattern mix with. I may eat my words on that but for now, I think I’ll stick with solids with this floral. I amazingly didn’t have an ivory Tippi sweater, so when I spotted one on sale, I added it to my collection. It is a bit on the sheer side though, so I am wearing my new favorite cami from Commando underneath (if you live in Buffalo – you can get it at Lace & Day). The tank is called the whisper tank and it is exactly that – a whisper thin cami that evens everything out underneath a light top. I used to hate layering tanks underneath sweaters because I was always tugging at my tank top but this one stays put. It’s a wardrobe staple for me now. Next up is a classic navy/pinstripe/white combination which I finished off with pearls and gold accents. Lastly, it wouldn’t be me if we didn’t fit in some pattern mixing! I’ve admittedly gotten in to the bell sleeve trend this season. My only issue with the ones that are cotton/dress shirt material is that they’re tough to wear under a jacket or blazer – the sleeves easily get squashed. It won’t happen as much if it’s a polyester or silk version but the cotton versions get scrunchy. I like this top a lot but it is definitely a bit of a wrinkle fest by the end of the day. The pants however are super comfortable, elastic waist and silk, and so comfortable. If I had wanted to tone this down a bit I could have added a navy blazer but that would defeat the purpose of these fun sleeves! I like this version of the top because the bell sleeve isn’t too voluminous and you don’t run the risk of dipping it in your lunch which I’ve seen happen with other tops of this style. So, there you have it, a few of my favorite outfits from April. Do you have any favorites? Would love to hear what you think and thanks for visiting!